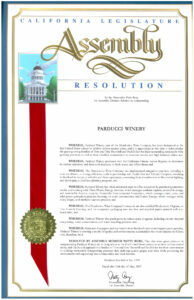 Parducci Winery has been designated as the first United States winery to achieve carbon neutral status. 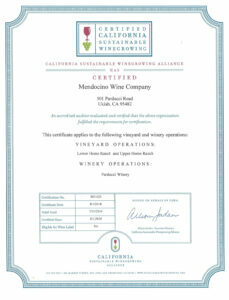 Mendocino Wine Company is a member of the California Sustainable Winegrowing Alliance (CSWA). 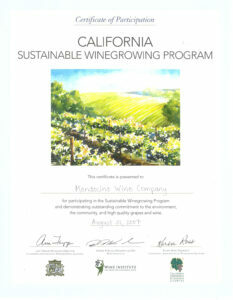 Certified California Sustainable Winegrowing (CERTIFIED SUSTAINABLE) is a certification program that provides verification by a third-party auditor that a winery or vineyard implements sustainable practices and continuous improvement. Businesses, organizations and public agencies across California are taking steps to save energy and reduce operating costs, and the state would like to recognize this hard work. Flex Your Power is California’s statewide energy efficiency marketing and outreach campaign. The campaign’s primary funding comes from the Public Goods Charge as approved by the California Public Utilities Commission (CPUC), as well as contributing municipalities and partner organizations and companies. 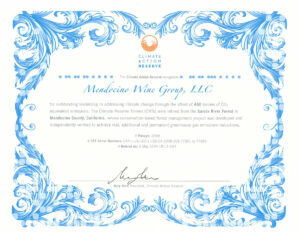 For outstanding leadership in addressing climate change through the offset of 480 tonnes of CO2 equivalent emissions. The climate reserve tonnes (CRTs) were retired from the Garcia River Forest in Mendocino County, California, whose conservation based forest management project was developed and independently verified to achieve real, additional and permanent greenhouse gas emissions reductions. 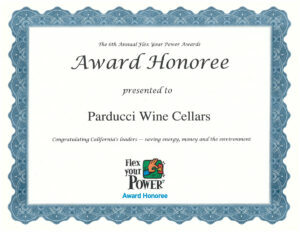 For participating in the Sustainable Winegrowing Program and demonstrating outstanding commitment to the environment, the community and high quality grapes and wine. CCOF is a nonprofit organization that advances organic agriculture for a healthy world through organic certification, education, advocacy, and promotion.